Sarah Ames Witherell, two months bereft of her eldest son, was entertaining again, if only for the family. She and her father, Old Oliver, had everyone in for tea. This must have been a good sign for the entire clan, as they could only have wished to see Sarah able to pick up her life again. 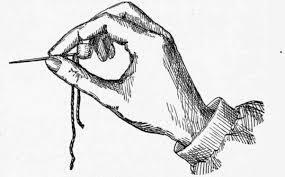 Evelina was dissatisfied with sewing done by her servant, Mary, and had her take out every stitch from a piece she had been working on in Evelina’s absence. No servant yet had been able to meet Evelina’s standard for needlework. She was too good at it, and seemed frustrated that she couldn’t rely on anyone else to accomplish what she herself was able to do. And she was doubly frustrated to find herself paying for a sequence of poor work being done, then undone, then redone. Not good for a Yankee. She would have to lower her standards, find someone who could do the work, or do it herself.